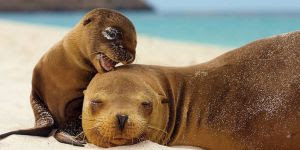 The Galapagos are one of the world’s last havens for wildlife -- pristine islands where giant tortoises, blue-footed boobies, and penguins live as they have for thousands of years. But tourism and development have recently skyrocketed, destroying the home of animals and plants found nowhere else on the planet -- leaving many species on the brink of extinction. So when a vital, 568-acre piece of land was put up for sale, local conservationists were terrified, sure it’d be razed to make way for a hotel. But then they came up with an amazing plan: buy the land themselves and create the islands’ first-ever private reserve to permanently protect the area!